Renewable energy sources including solar, wind, geothermal, and biomass can provide energy for your facility. Some companies have benefited from installing solar panels, while others have purchased wind energy through their utility company. Retrofitting your facility to use renewable sources of energy can be an intensive and costly project. Before beginning a renewable energy project, you should carefully consider what technologies best meet your facility’s needs. The following technologies help businesses use renewable energy sources. MnTAP does not endorse these technologies, but highlights them to provide you with examples of what other companies have implemented. SolarWall: This patented solar air heating system heats building ventilation air and can offset traditional heating load. It is typically installed on roofs or walls and the energy can be used for a variety of applications including process functions. This technology has been installed at a Minneapolis police station, a school site in Minneapolis, and at Aveda Corporation. 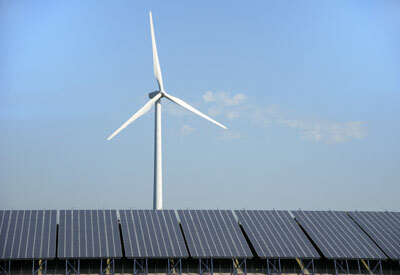 Wind Energy: Wind power supplies up to 60% of the’ electricity needs. The energy turbine, which began generating power in March 2005, produces 5.6 million kilowatt hours of power each year for UMM.